When your baby’s first tooth arrives, it’s an exciting time! After all, this is your child’s next step in learning to navigate and enjoy solid foods and form their first words. 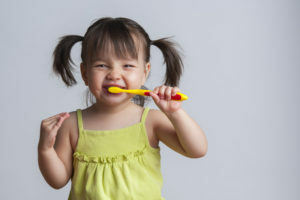 You may have a lot of questions about caring for your little one’s baby teeth or when you should begin to brush them, and your children’s dentist in Newbury Park has the answers to help put your child on the path to a lifetime of happy, healthy smiles. You should begin brushing your child’s first teeth with a soft brush designed for infants as soon as they arrive. This will not only help to remove the sugars and bacteria buildup from the teeth, it will also acclimate them to the feeling of brushing their teeth. As they get a little older, you can incorporate a toothpaste that is safe for children to swallow. When they are old enough to spit, around the age of 3 or 4, you can start to use a toothpaste with fluoride to help build and strengthen their developing teeth. Your baby should begin seeing their dentist in Newbury Park within six months after their first tooth arrives, but no later than their first birthday. While this may seem very early, it helps your child acclimate to the dental office, while also allowing the dentist to begin monitoring their oral health and development. They will continue to see the dentist every six months just like you do. Teaching your child to eat fruits and vegetable is not only good for their overall health, it also helps to protect their oral health. Most of us realize that sugary foods and drinks are bad for our teeth; however, did you know that there are foods that can actually help to protect your child’s oral health? It’s true! Fruits and vegetables actually help to neutralize the acids in your little one’s mouth that cause tooth decay and cavities. They also increase saliva flow. Saliva is a natural protectant for your teeth and it washes away the excess food and debris that can leave bacteria in the mouth. As your child gets older, your dentist may recommend additional services such as fluoride treatments or dental sealants. Fluoride helps build strong and healthy enamel on developing teeth, while dental sealants are thins coatings placed over the chewing surface of your child’s molars to protect them from decay. Do you have more questions about your child’s oral health? Don’t hesitate to give your dentist a call today to learn more. For over forty years, Dr. Gary Chaffee has been caring for both adults and children in Newbury Park, CA. With his extensive knowledge and training, he is able to offer comprehensive services for his patients so that referrals to other specialists are rarely necessary. Patients love the personalized care they receive at Paraiso Family Dental & Orthodontics. If you would like to contact Dr. Chaffee, he can be reached through his website or by calling 805-480-0033.